If using a silicone mold, prepare mold by spraying lightly with cooking spray, then wiping each mold cavity clean with a paper towel. This will leave a slight residue to aid in un-molding without affecting the taste or appearance of the jelly pops. If setting in a glass or non-reactive metal baking pan, no prep is needed. Red Layer. Dissolve strawberry gelatin in boiling water. Add cold water. Pour 1 tsp. into each mold cavity. Refrigerate until firm but not fully set (30 to 45 minutes. Prepare Pink Layer. Pink Layer. Pour water into small saucepan. Sprinkle with gelatin and allow to soak for a minute or two. Heat over low heat, stirring constantly, until gelatin is dissolved, about 5 minutes. Remove from heat and stir in yogurt. Allow to cool to room temperature. Pour 1 tbsp into each mold cavity. Refrigerate until firm but not fully set (30 to 45 minutes). Prepare White Layer. White Layer. Pour water into a small saucepan and sprinkle with gelatin. Allow to soak for a minute or two. Heat over low heat, stirring constantly, until gelatin is dissolved (about 5 minutes). Stir in the sweetened condensed milk. Allow to cool to room temperature. Pour approximately 2 tsp. into each mold cavity. Refrigerate several hours or overnight, until fully set. Garnish each jelly pop with a coffee stirrer segment, if desired. Valentine’s Day is traditionally kinda “couple-y”, and I couldn’t quite wrap my brain around a “jelly shot” for two. So I decided to focus on a cute treat for kid’s parties, Valentine Jelly Pops. My last experiment in this vein was for Halloween, Candy Corn Jigglers, which generated a ton of buzz on the Jelly Shot Test Kitchen blog and are still a draw to the site several months later. I used a flexible silicon mold (a flexible silicone mini muffin pan would also work). But the recipe could be set in an 8x8-inch glass or non-reactive metal pan and cut into cubes, jiggler style, for equally adorable results. 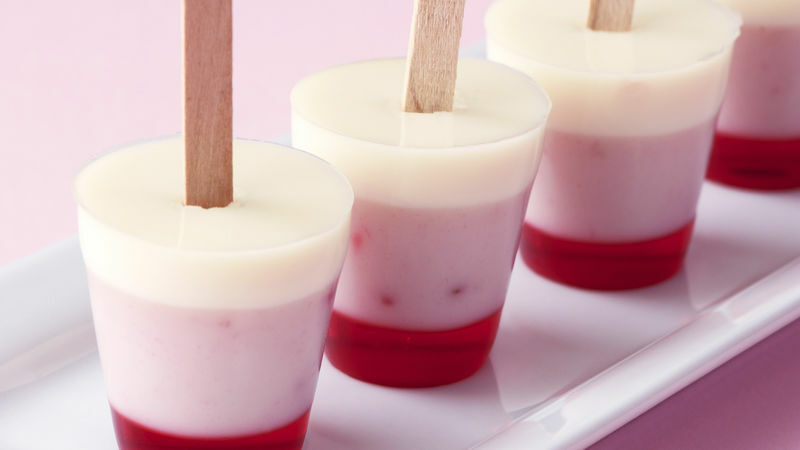 Whatever method used to set them, these jelly pops are adorable served “popsicle style” using cut lengths of wooden coffee stirrers – they are such fun for little hands to hold on to! Who is your valentine? XO and Happy Valentine’s Day! P.S. Additionally, based on the uproar over not including an “adult version “ of the Candy Corn Jiggler for JSTK (and it was considerable), I feel compelled to add that although these are for kids, an adult version could be fashioned by substituting vodka or rum for 1/2 of the water. Chill the alcohol in the freezer and add it last!